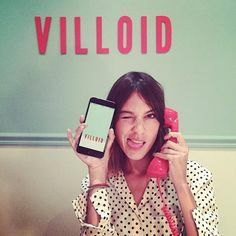 VILLOID — her new social style app — actually helps you celebrate the process of getting dressed. The app was designed to “make shopping easier,” a wish shared by almost all who care about their appearance. VILLOID blends Pinterest and Instagram but specifically targets fashion and it even has a BUY button. You can simply browse street style looks and mood boards. Then, share your style by uploading products and photographs, follow friends and fellow style mavericks, love boards and individual items. And if there’s something you absolutely must have , simply click on the buy button to purchase it. See…easy peasy! The app is now available in App stores globally and the Android version is set to launch late 2015/early 2016.